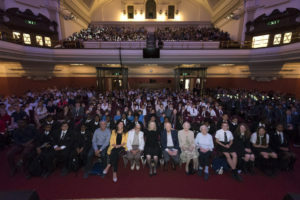 8,500 London school children have attended live performances of the “Children of Willesden Lane” to educate them on the Holocaust and, more specifically, to help them to understand the experiences of those saved by the Kindertransport as it marks its 80th anniversary this year. The performances are part of multi-disciplinary project run by the Holocaust Educational Trust (HET), with support from the Association of Jewish Refugees, entitled “Stories from Willesden Lane”. The initiative has seen young people across the capital learn about and reflect on Britain’s response to the plight of the Jews of Europe and will ensure that the stories of the children who rebuilt their lives in Britain. “The Children of Willesden Lane” tells the story of Lisa Jura who was brought to England on the Kindertransport. Lisa was forced to flee her home in Vienna as a young girl and rebuild her life in London during World War Two. The show was performed by concert pianist Mona Golabek, daughter of Lisa Jura, who has previously told her mother’s story to 250,000 school children in the US but never before in the UK. The performances took place at the Westminster Methodist Central Hall, with schools invited to attend one of five shows across the 11th and 12th June. Londoners were also treated to a rare, one-off gala performance of the show on Sunday 10th June, as Mona Golabek retraced her mother’s steps and took to the stage in Wigmore Hall, Marylebone. Kindertransport refugees attended all of the performances, including Harry Bibring BEM (who did a live webcast for the Trust to over 8,000 students), and Kurt Marx and Hennie Franks who both lived at Willesden Hostel at the same time as Lisa Jura. Vera Schaufeld and Eve Willman attended school performances whilst Bob and Ann Kirk attended the Gala performance.